Boulder’s Folsom Street on Friday afternoon. Photo: Eric Budd. Boulder, Colo., will vote Tuesday on whether to become the fourth U.S. city to remove a modern protected bike lane. The others are Memphis, Tenn., where a riverside project was removed this year after the end of a one-year pilot; Boise, Idaho, where a downtown network was removed last year after the end of a one-month trial; and Portland, Ore., where in 2012 the city decided not to replace a series of posts that had been torn out by car collisions on one of its bridges. As of last month, 75 U.S. cities (including Memphis, Portland and Boulder) have built permanent protected bike lanes, and the number of such projects is doubling every two years or so. In Boulder, though, the latest process has taken a turn. On Thursday, city staff recommended scaling back what was planned as a year-round pilot after just 11 weeks. That’s an unexpected change of direction for one of the four cities in the country rated as “platinum” by the League of American Bicyclists. The protected bike lanes on Folsom Street were added in July as part of a redesign that replaced two general travel lanes in each direction with one general travel lane in each direction plus a new center turn lane. The number of reported collisions on the street dropped immediately, city data show. As you can see, the number of bike crashes actually went up … because the number of bikes went up. See below. That’s consistent with similar turn-lane projects around the country. The Federal Highway Administration says these redesigns lead to a 19 to 47 percent drop in collisions, because they prevent the most reckless drivers from weaving between travel lanes and because they give everyone driving a clear view of people crossing the street on foot — a car driving in the curbside lane won’t block the sight line of someone else driving in the same direction. The new center turn lane, meanwhile, cancels out most of the potential traffic delay because it gives left-turning cars a place to wait without blocking other traffic. In the case of Folsom, the redesign had a side benefit: it let the city widen the existing bike lanes and add plastic posts to turn them into protected bike lanes. The project’s installation corresponded with the normal increase in biking after school returned to session, so it’s hard to know how much the lanes contributed to the immediate jump in bike use. But because rush-hour auto volumes were so high on Folsom, and because the city had previously installed a pair of mid-block crossing signals in an effort to make the street safer to walk across, safety and increased bike use weren’t the only effects. During its busiest time and direction, the southbound evening rush hour, it took an extra 104 seconds on average to travel the eight-tenths of a mile on Folsom between Valmont Road and Canyon Boulevard. This made some Boulder residents furious. In a letter to the Boulder Daily Camera, one week after the city’s first responders had told the newspaper that the redesign would have no effect on their work, resident Jeff Schulz painted a satirically dire scenario of what might happen in a future fire. Other Boulder residents favor the Folsom redesign. 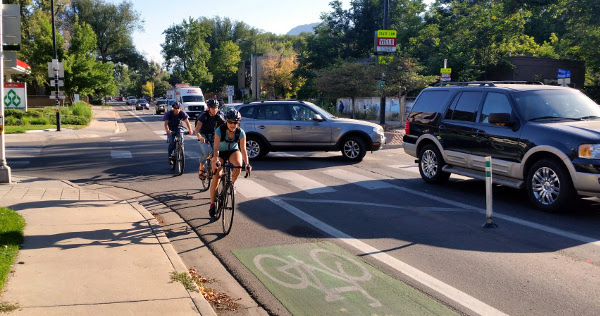 In part due to an organized effort from Boulder-based advocacy group PeopleForBikes to rally support among the city’s bike supporters, 57 percent of the comments the city received about the project by late August were in support. But the other 43 percent tended to be angrier, and more likely to have contacted the city of their own volition. “The community has been pretty clear that parts of this project are not successful for them,” Councilman Sam Weaver, who had voted for the plan in June, told the Camera on Friday. 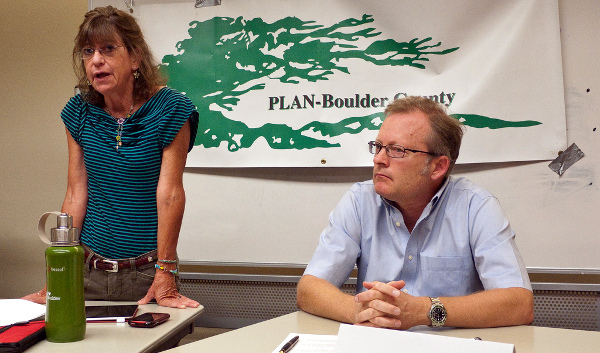 Boulder council member Lisa Morzel, left, at a 2011 election forum. Photo: Zane Selvans. One month ago, Boulder’s council had seemingly agreed to stick with the Folsom redesign for a while. That changed last week. Go Boulder Manager Kathleen Bracke said in an interview that staff from the city’s transportation, public works and city manager’s offices had come to a mutual decision to recommend reversing the southern half of Folsom’s redesign, a sharp turnaround from August. Sue Prant, executive director of Boulder-based advocacy group Community Cycles, said that efforts from council members Lisa Morzel and George Karakehian preceded the sudden change of direction from staff. Prant said Boulder’s change of direction is upsetting because it suggests to her that many residents of the famously green and well-to-do city aren’t willing to actually change their habits in order to preserve the climate. If car lanes are untouchable, how can car dependence be reduced? 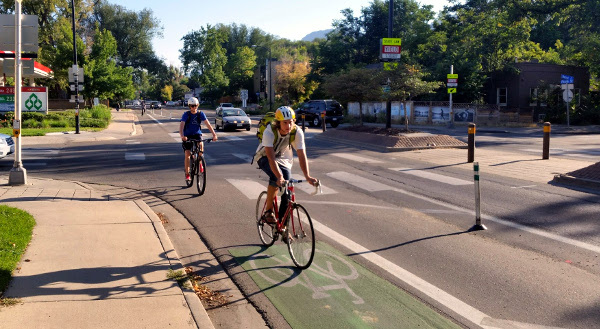 Former Boulder mayor Will Toor said in an interview that the fight over Folsom reminded him of a similar battle, when he was elected mayor in 1998, over whether the city should invest in biking and walking or should keep building ever-wider roads. “That seemed to be a really powerful and positive argument that a wide variety of people in the community were able to see,” Toor said. As for Boulder’s current council, Toor said that if they agree to reverse the changes to Folsom, he hopes they’ll propose alternative ways to reduce the city’s dependence on cars. Prant predicted that such a high-profile retreat by the city would mean that “it’s going to be a long time before you can do any major on-street improvements.” She said the city will probably try to refocus its biking investments on more off-street paths where they’re possible. Correction 9/28: A previous version of this post didn’t mention that the increase in bike traffic on Folsom corresponded to the return of the school year.